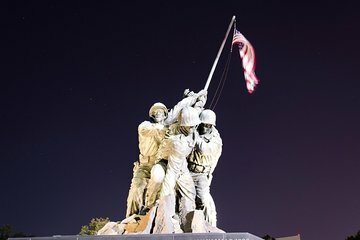 Check out Washington DC’s memorials and other landmarks illuminated after dark on this evening sightseeing tour. Travel through the city by coach or open-top bus to admire the White House, Lincoln Memorial, Vietnam Veterans Memorial, Korean War Memorial, the US Capitol and more. Stop for photo ops, and soak up the twinkling atmosphere of the American capital at night. Our tour fell during "peak bloom" of the cherry blossoms, so we were late arriving at the bus. The guide held the bus for us which was greatly appreciated! Our tour guide was Mike. He was funny and knowledgeable about the sites he pointed out. The description said we could walk around two sites, but we actually made three stops which made us very happy! This was a very good value for the price. Our bus driver was great but we didnt get to see all of the things we would have liked to, after dark. It was very crowded in DC and there were a few times when he couldnt find a place to park his bus. Also, expected to see Iwo Jima memorial but road was blocked. It seems like that should have been known prior. Honestly, I wasn't impressed. Yes the driver told us he was going to leave if we weren't back on time but he knew I was planning on being back with them. I was actually 5 minutes early. Instead I found myself completely lost at the Lincoln memorial and I was only lucky my taxi was there. I did however get some GREAT photos- that much I was happy with. Look if you can get to the memorials via taxi do that because then you can choose how long you were there for. We also missed out on seeing the Whitehouse which was a big part of why I wanted to go. The Trump jokes made everyone to embarrassed to admit they really wanted to see it and we got to see the back white wall only. Overall a very average tour. My family and I enjoyed the tour very much. It was very easy to find the pickup location. Tour guide/driver was knowledgeable. Lights on the bus were turned off making it easy to see the sights in the dark. It was especially nice to see the holiday decor throughout the city. We would recommend it! Almost impossible to see out of bus after dark. Too much reflection off from the windows. Driver was great!! Time fly's by...so much to see! !